Fall is here...and that means i is also soup season!! 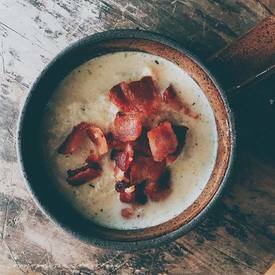 This Cauliflower & Bacon Soup recipe from Cosmopolitan Cornbread is an easy, one pot meal that cooks up in less than an hour. You will love the flavor in this paleo veggie soup. It has the comforting feel of a potato soup, yet there’s not a potato in sight. You can enjoy this quick-to-make soup any night of the week, without an ounce of guilt.